The newly-constructed Vancouver neighbourhood housing Olympic and Paralympic athletes and coaches during the 2010 Games now has a new distinction to add to its resume: the world's greenest. The Olympic Village in Vancouver's Southeast False Creek was awarded LEED Platinum certification by the U.S. Green Building Council (USGBC) Tuesday, certifying it as the greenest, most energy efficient and sustainable neighbourhood on Earth. "This should be a source of pride for residents and an example to the rest of the world," Vancouver Mayor Gregor Robertson said in a press conference. "[This] is a big feather in our cap, as we move towards our goal of becoming the greenest city in the world by 2020." 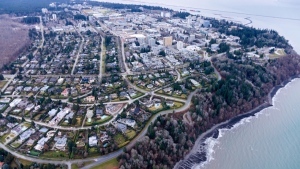 The distinction is awarded based on a myriad of factors, including proximity to the downtown core, mixed residential and commercial use, affordable housing, green and energy efficient buildings and habitat restoration. Southeast False Creek also received points for building the Neighbourhood Energy Utility, the city's first renewable heating system. It also scored high for the net zero building, a structure that produces as much energy as it consumes. The emerging neighbourhood is the second in the world to achieve LEED Platinum status. The first is Dockside Green in Victoria, B.C. "As far as we know there's nowhere comparable in the world," Robertson said. The former industrial site on False Creek northwest of Science World, which currently houses 2,600 athletes and coaches, will be home to up to 16,000 people once construction is complete. "When the Games end, Vancouver will have a thriving mixed-use community of housing and retail, commercial and public spaces that will be a singular reminder of how the Olympic spirit inspires us all to achieve our dreams," said the Tim Cole of the U.S. Green Building Council. Tim Cole of the U.S. Green Building Council presents Vancouver Mayor Gregor Robertson with the LEED Platinum award for the False Creek South neighbourhood. Feb. 16, 2010.